I’ve always loved the noise of a football crowd when a goal goes in. There’s something visceral and emotional about that roar, it’s a release like none other. That’s one of the reasons I absolutely love this video about Sport’s campaign to boost the number of organ donors in Pernambuco, where the club plays its home games. The emotion of the crowd at the start of the clip is a thing to behold. That emotion is nothing when compared to what comes next. Sport fans awaiting transplants guarantee their future donors that their passion for the club will live on after they die. “I promise your eyes will keep on watching Sport,” says Adriano dos Santos, a fan awaiting new corneas. “Your lungs will keep on breathing for Sport,” says Luiz Antonio, a fan awaiting a lung transplant. And “I promise your heart will keep on beating for Sport,” says Marleide dos Santos, who is awaiting a new heart. It’s such a simple and yet brilliant idea and it has led 57,000 Sport fans to register as organ donors. Enough of them, in fact, that the waiting list for heart and cornea transplants in Pernambuco state has been cut to precisely zero. More clubs should join up. As Brazil prepare to play Italy in Felipao’s second friendly match on Thursday night, here’s a reminder of why such games are taking place in Geneva, a home stadium for neither country. Among the reasons: Time, money, and globalisation, as I say in my Reuters story from last year. “It’s a trend,” says the headline and it’s not wrong. It’s increasingly common for two international teams to face off in a third country. The matchups and venues often sound completely random. Ireland have played Italy in Belgium and Oman in England. England have faced Brazil in Qatar and Italy in Switzerland. Argentina have taken on Nigeria in Bangladesh and Venezuela in India. At least Brazil vs. Italy is more attractive than Brazil against Iraq in Sweden or Brazil against Japan in Poland. 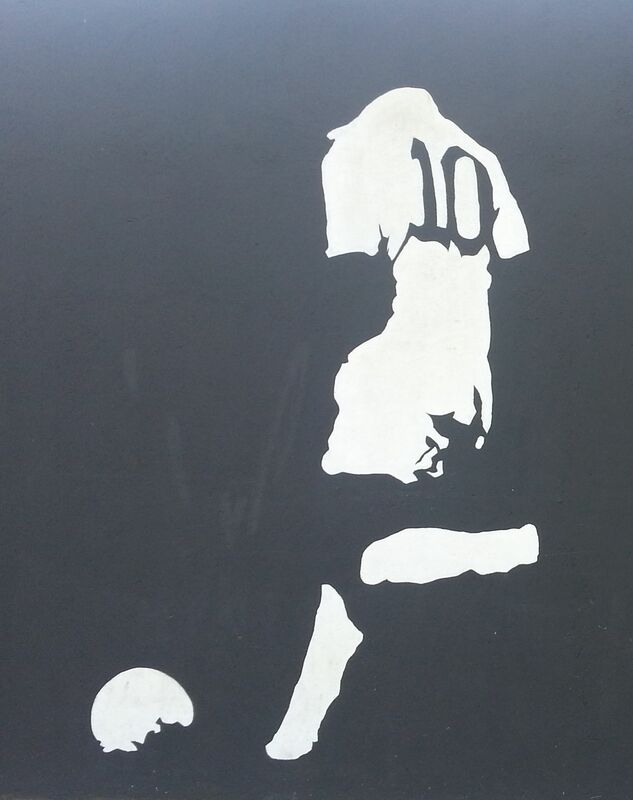 Here’s the most iconic image of Pele, taken from the mural that surrounds Santos’s training ground. For no other reason than it’s cool. President Dilma Rousseff today once again said Brazil needs to become more competitive, improve its infrastructure and cut down on red tape. I’d feel a lot more supportive of Dilma if there seemed to be any real action behind those rousing and sensible words. Brazilians still pay more taxes than anyone in the developing world and the government hasn’t made any real attempt to cut them. 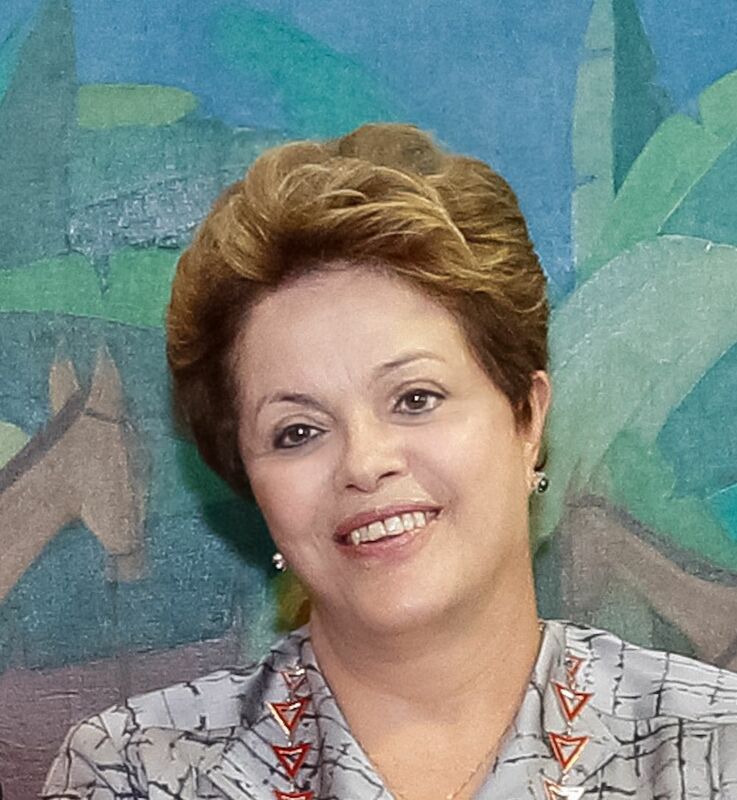 Dilma has at least tried to encourage the private sector to get involved in building infrastructure. It’s still way too little, but it’s something. And as for cutting bureaucracy, nothing meaningful has been done. Chile, for example, announced this week it would allow people to open a business in one working day. In Brazil it takes 119 days, according to this World Bank report. Talk is cheap and action speaks louder than words. Brazil needs more of the former and more of the latter. Worrying news from Brazil, where the first matches to be played in a renovated World Cup stadium were a failure with the paying public. Only 33,000 fans turned out to see the double header that opened the Castelão stadium in Fortaleza. 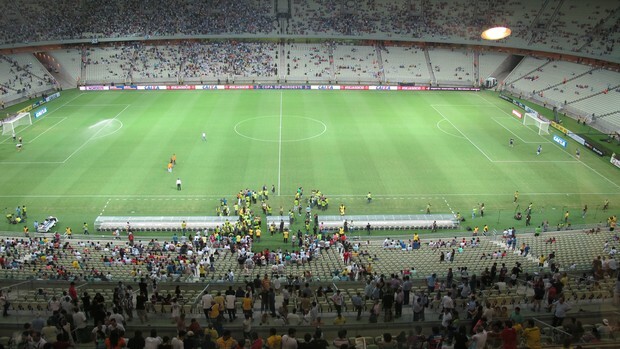 The city’s two biggest teams, Fortaleza and Ceara, played games one after another on Sunday but still only half the capacity of 64,000 people turned up. Why were fans reluctant to see such a big event live? Could be high prices. Could be that the games are on TV. Could be that they are treated like cattle by police and security. Could be that public transport to the game is atrocious and parking is absurdly expensive. I wrote about those issues in this Reuters piece last week and the broader fear that real fans will be priced out of the new grounds. (Reuters) – Upgrades to Brazil’s crumbling football stadiums ahead of the 2014 World Cup promise a safer, cleaner and altogether more pleasant environment for fans but the luxurious new grounds come at a price – quite literally. Brazilian fans are already complaining about high ticket costs and a debate has begun over whether some supporters will be priced out of venues that boast cinemas, shops, restaurants, and even automatically flushing toilets. “I fear that the new stadiums being built for the World Cup will make football more elite,” Tostão, a former World Cup winner with Brazil in 1970, said in a recent newspaper column. Tostão, once again, got it right. Brazil has to be very careful here. It doesn’t want to go the way of England, where working class fans have been priced out and football lost it soul. The Brazilian government invited a select group of foreign journalists to Brazil last month to take a sneak peek at preparations in the World and Confederations Cup cities. They have a slightly different perspective from me in that they are more concerned largely with the logistics of covering the tournament. But it’s still interesting to hear their thoughts. BRAZIL. A country that conjures up images of sunshine, fabulous beaches, carnivals, Pele…the most successful nation in World Cup history, so what better place to stage the 2014 World Cup finals? Mike, in one sentence, what was your verdict? MC: It will be a fabulous World Cup, but it will not be easy. MC: Travel and the language, the travel first. Brazil is a massive country and to travel around it is fraught with difficulty. We were on an organised FIFA/Government/State Travel Agency tour and we still encountered problems at airports. MC: The airport at Belo Horizonte was particularly chaotic where the Departure Gate changed four times in the hour before the flight, causing general mayhem. We were lucky to be in the hands of the Brazilian travel people. Anyone in the airport that day who did not speak Portuguese could have been left stranded. The travel did work and was generally OK, but it is organised chaos and very stressful. We took nine flights in just over 10 days and every single seat on every plane was taken. Can’t you drive between the host cities? BH : Only a very few journeys are drivable. Rio de Janeiro-Sao Paulo is about five hours, other trips of a similar distance would be Sao Paulo-Curitiba, Belo Horizonte-Rio and Recife-Natal. Forget anything else, notably Sao Paulo-Cuiaba which is 24 hours, Rio-Recife which is 60 hours and especially Porto Alegre-Manaus which is 72 hours by coach to Belem and four days on a boat Belem-Manaus. On the shorter journeys, what are the coaches like? BH: The buses are quite comfortable, by that I mean no chickens or pigs inside, but there is a small risk of hi-jacking. The usual trick is for a couple of crooks to get on posing as passengers and their colleagues to follow in a car. When the bus reaches the outskirts of the city or somewhere remote, it is forced down a side road, the passengers are robbed at gunpoint and are often locked in the baggage hold. There are no long-distance trains in Brazil. So what is your advice to football writers and supporters? BH: Travel is best kept to a minimum. The system struggles to cope even with Brazilian holiday periods so I have no idea how they will manage with a World Cup. Flights are long and expensive. Sao Paulo-Manaus is three-and-a-half hours non-stop, Sao Paulo-Recife is three hours. Some venues such as Cuiaba, Goiania and Natal often have only a few flights a day, all on smaller aircraft so I don’t know what they will do if they suddenly have 10,000 Dutch fans wanting to go travel. What about flying to Brazil initially? BH: Where possible, it is best to fly direct to your Brazilian destination rather than going via Rio or Sao Paulo and taking a domestic flight. TAP is the only airline which flies from Europe direct to Brasilia, Belo Horizonte, Fortaleza, Salvador and Recife as far as I know, via Lisbon obviously. I think you can fly to some of these places via Miami although that means facing Homeland Security. How did you get to Brazil, Mike? MC: I flew from London to Brazil via Miami. The flight times were only two hours apart and this led to huge problems and loss of luggage for three days. Copa flies from Panama City direct to Manaus, Brasilia and Recife which may be a good alternative. They have a code-sharing agreement with KLM which flies to Panama from Amsterdam. Panama City airport is a much better place to change planes than Miami. It’s small, well-organised and you don’t have to go through immigration or collect luggage. Football writers often do two jobs in a day, such as a press conference and then a match. Will this be a problem? MC: I think one factor we must minimise for reporters is stress. It can take hours sitting in traffic to reach anywhere in the cities. In terms of a working day at the World Cup, I think it will be impossible for a reporter to do anything other than cover one thing on match day – the match. In my view, it will not be possible for a reporter to, say, cover a press conference in one part of town, and the match in another on the same day. MC: I would advise everyone going to the World Cup to start taking lessons in Brazilian Portuguese. Seriously. If you are out and about, you cannot rely on getting by with just English in your linguistic arsenal. Even when we were in Fortaleza, a Spanish colleague on the tour had some troubles making himself understood. Very few taxi drivers speak English, and generally very few other people do either. Often there is no other lingua franca, as we say in Aldgate. MC: The language issue leads me to the hotel situation. We were staying in very good four star hotels near the centres of town and language was again an issue. I stayed in eight hotels in 10 days or so and some common links were obvious. Of course, front desk staff spoke English, but often not that well, and certainly, if any complicated issue arose as it did with a loss of someone’s luggage at one point, the staff had to liaise with our guides to sort out the problem. The hotels where we stayed were fine, two or three were on the beachfront, they did feel safe and secure and this is the priority. But check-ins and check-outs at every hotel seemed to be based on some ancient unworkable greater Brazilian hotel mastercomputer and took forever. What advice for journalists and supporters about hotels? I am sure if you are travelling with an organised Football Association or BAC tour you won’t have problems. If you are making any individual or independent plans, do not scrimp pennies on staying in out of the way places that are off the beaten track without WiFi and internet. It will be totally counter-productive and reporters/photographers/engineers/techies will simply not be able to function properly. Brian, you know Brazil very well, what advice do you have? BH: A big warning: many websites include hotels which are often in very dodgy areas, especially in Rio de Janeiro. For example, the Sheraton in Rio is opposite a huge favela (shanty town). Locations should be checked very carefully by whoever gets lumbered with this job. City centre hotels should be avoided in Brazil as most city centres are deserted at night and weekends, making them a mugger’s paradise. The best hotels and restaurants tend to be concentrated in outlying, upmarket neighbourhoods. In Rio, these are Flamengo, Copacabana, Ipanema, Leblon and Barra. BH: Barra is the home of the new rich and has sprung up in the last 30 years. Brazilians think it’s like Miami, perhaps unaware than Miami doesn’t have open sewers all over the place. You can’t really walk around it. And the better places elsewhere? BH: In Sao Paulo it’s Itaim and Jardins. In the cases of Recife, Salvador, Natal and Fortaleza, the best hotels are on the beachfront. In motels, rooms are rented by the hour and are often on the main highways into cities, surrounded by shanty towns. Probably don’t need to say any more. MC: The Agencies delegates on the tour had a meeting with FIFA and Embratour, the Brazilian State travel agency, who strongly recommended, where possible, for companies to hire cars with drivers. Driving in a Brazilian city such as Sao Paulo or even Salvador is not just like tootling down the High Street to buy a packet of biscuits at Londis. Much of the driving I saw was bonkers, even by London standards. So a Brazilian SatNav should be on the wish-list? BH: Not necessarily. It’s very easy to take a wrong turning and end up in a dangerous favela. Car-jackings are a threat on motorways in most cities. It’s inadvisable to stop at red lights in deserted areas in cities at night. GPS systems also happily take you to favelas. Road rage is rampant and traffic disputes are often settled with the use of a gun or knife. Radio taxis are far safer than taxis hailed in the street if you don’t speak the lingo. 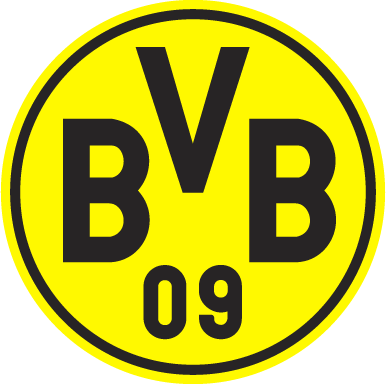 We heard horror stories about crime and law and order before South Africa 2010 plus Euro 2012 in Poland and Ukraine. Both tournaments were completed with very few problems in this respect. Will it be a similar story in Brazil? BH: The thing about crime is, it can be very variable. Rio has become much safer and a lot of what is written about bus hold-ups and the dangers of withdrawing cash from ATM machines may no longer apply. When I was there in November, people were talking about the improvements and were also wondering where all the crooks had been sent as you simply don’t see them any longer. On the other hand, Sao Paulo seems really nasty at the moment. Policing is the responsibility of the state governments, not the federal government or municipalities, and safety varies wildly depending on who is in power. If Rio were to elect a new governor with different policies next time around, it could deteriorate again very quickly. How are the stadiums coming along? MC: We saw six stadiums on our tour at Rio, Fortaleza, Salvador, Recife, Brasilia and Belo Horizonte and while all were in various states of readiness, the press areas and planned press areas seemed to be first class. They were very spacious and when they are kitted out, they will meet the highest international standards. The press boxes all seemed a little high, but roomy and will also have, FIFA assured us, free WiFi/internet. MC: The warm-up tournament is being treated very seriously by everyone. FIFA are continually monitoring the stadium building to ensure everything is ready by March for the Confederations Cup in June. 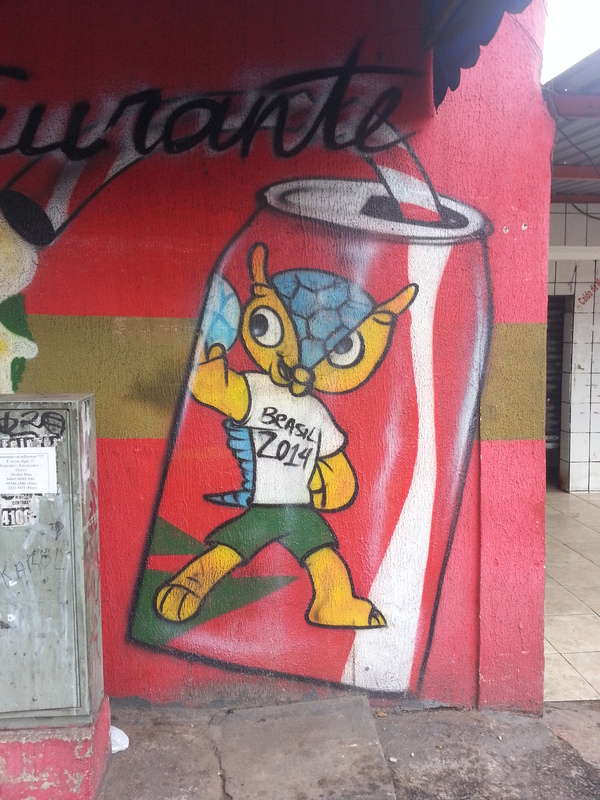 While the LOC’s [local organising committees] say everything will be ready, I have my doubts about Rio and Brasilia. However, the Confed Cup can serve as an excellent precursor for us as well and, granted, it is not the most important tournament in world soccer, it is very important for us as a logistical run-through.